The National Aeronautics and Space Administration (NASA) is an agency of the United States Government, responsible for that nation's public space program. Established on July 29, 1958 by the National Aeronautics and Space Act. Aeronautics: pioneers and proves new flight technologies that improve our ability to explore and which have practical applications on Earth. Exploration Systems: creates capabilities for sustainable human and robotic exploration. Science: explores the Earth, solar system and universe beyond; charts the best route of discovery; and reaps the benefits of Earth and space exploration for society. Space Operations: provides critical enabling technologies for much of the rest of NASA through the space shuttle, the International Space Station and flight support. In the early 21st century, NASA's reach spans the universe. Spirit and Opportunity, the Mars Exploration Rovers, are still studying Mars after arriving in 2004. Cassini is in orbit around Saturn. The restored Hubble Space Telescope continues to explore the deepest reaches of the cosmos. Closer to home, the latest crew of the International Space Station is extending the permanent human presence in space. Earth Science satellites are sending back unprecedented data on Earth's oceans, climate and other features. NASA's aeronautics team is working with other government organizations, universities, and industry to fundamentally improve the air transportation experience and retain our nation's leadership in global aviation. Education, including focus on Science, Technology, Engineering and Math (STEM). October 1, 1958, the official start of the National Aeronautics and Space Administration (NASA), was the beginning of a rich history of unique scientific and technological achievements in human space flight, aeronautics, space science, and space applications. Formed as a result of the Sputnik crisis of confidence, NASA inherited the earlier National Advisory Committee for Aeronautics (NACA), and other government organizations, and almost immediately began working on options for human space flight. NASA's first high profile program was Project Mercury, an effort to learn if humans could survive in space, followed by Project Gemini, which built upon Mercury's successes and used spacecraft built for two astronauts. NASA's human space flight efforts then extended to the Moon with Project Apollo, culminating in 1969 when the Apollo 11 mission first put humans on the lunar surface. After the Skylab and Apollo-Soyuz Test Projects of the early and mid-1970s, NASA's human space flight efforts again resumed in 1981, with the Space Shuttle program that continues today to help build the International Space Station. Building on its NACA roots, NASA has continued to conduct many types of cutting-edge aeronautics research on aerodynamics, wind shear, and other important topics using wind tunnels, flight testing, and computer simulations. NASA's highly successful X-15 program involved a rocket-powered airplane that flew above the atmosphere and then glided back to Earth unpowered, providing Shuttle designers with much useful data. The watershed F-8 digital-fly-by-wire program laid the groundwork for such electronic flight in many other aircraft including the Shuttle and high performance airplanes that would have been uncontrollable otherwise. NASA has also done important research on such topics as "lifting bodies" (wingless airplanes) and "supercritical wings" to dampen the effect of shock waves on transsonic aircraft. Additionally, NASA has launched a number of significant scientific probes such as the Pioneer and Voyager spacecraft that have explored the Moon, the planets, and other areas of our solar system. NASA has sent several spacecraft to investigate Mars including the Viking and Mars Pathfinder spacecraft. The Hubble Space Telescope and other space science spacecraft have enabled scientists to make a number of significant astronomical discoveries about our universe. NASA also has done pioneering work in space applications satellites. NASA has helped bring about new generations of communications satellites such as the Echo, Telstar, and Syncom satellites. NASA's Earth science efforts have also literally changed the way we view our home planet; the Landsat and Earth Observing System spacecraft have contributed many important scientific findings. 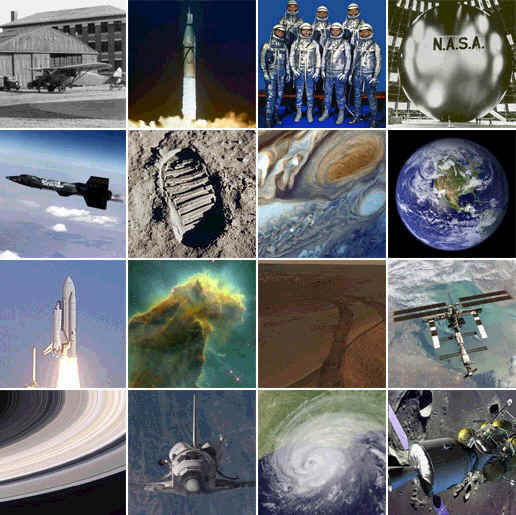 NASA technology has also resulted in numerous "spin-offs" in wide-ranging scientific, technical, and commercial fields. Overall, while the tremendous technical and scientific accomplishments of NASA demonstrate vividly that humans can achieve previously inconceivable feats, we also are humbled by the realization that Earth is just a tiny "blue marble" in the cosmos. Spacemen of fiction - Jules Verne's travelers to the Moon, or the comic strip heroes Flash Gordon and Buck Rogers - were familiar characters midway through the 20th Century, but nobody could describe accurately a real astronaut. There were none. Then in 1959 the National Aeronautics and Space Administration asked the United States military services to list their members who met specific qualifications. The search was underway for pilots for the exciting new manned space flight program. In seeking its first space pilots, NASA emphasized jet aircraft flight experience and engineering training, and it tailored physical stature requirements to the small cabin space available in the Mercury capsule then being designed. Basically, those 1959 requirements were: Less than 40 years of age; less than 5ft. 11 inches tall; excellent physical condition; bachelor's degree or equivalent in engineering; qualified jet pilot; graduate of test pilot school, and at least 1500 hours of flying time. More than 500 hundred men qualified. Military and medical records were examined; psychological and technical tests were given; personal interviews were conducted by psychological and medical specialists. At the end of the first screening, many candidates were eliminated and others decided they did not want to be considered further. 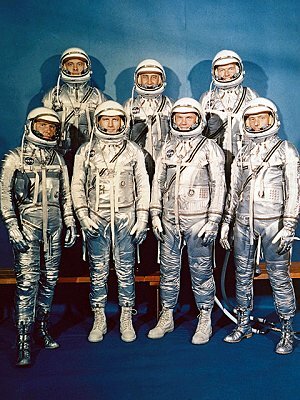 The 'Mercury Seven' were Scott Carpenter, Gordon Cooper Jr., John Glenn Jr., Virgil 'Gus' Grissom, Walter M. Schirra Jr., Alan B. Shepard Jr., and Donald K. 'Deke' Slayton. Even more stringent physical and psychological examinations followed, and in April 1959 NASA announced its selection of seven men as the first American astronauts. They were Navy Lieutenant M. Scott Carpenter; Air Force Captains L. Gordon Cooper, Jr., Virgil I. "Gus" Grissom, and Donald K. "Deke" Slayton; Marine Lieutenant Colonel John H. Glenn, Jr., and Navy Lieutenant Commanders Walter M. Schirra, Jr., and Alan B. Shepard, Jr.
Each flew in Project Mercury except Slayton, who was grounded with a previously undiscovered heart condition. After doctors certified that the condition had cleared up, Slayton realized his ambition to fly in space 16 years after his selection. He was a member of the American crew of the Apollo Soyuz Test Project in July 1975, the world's first international manned space flight. Three years after that first selection, NASA issued another call for Gemini and Apollo astronaut trainees. Experience in flying high-performance aircraft still was stressed, as was education. The limit on age was lowered to 35 years, the maximum height raised to 6 feet, and the program was opened to qualified civilians. This second recruitment brought in more than 200 applications. The list was screened to 32, then finally pared to nine in September 1962. Fourteen more astronaut trainees were chosen from nearly 300 applicants in October 1963. By then, prime emphasis had shifted away from flight experience toward superior academic qualifications. In October 1964 applications were invited on the basis of educational background alone. These were the scientist-astronauts, so called because the 400-plus applicants who met minimum requirements had a doctorate or equivalent experience in natural sciences, medicine, or engineering. These applications were turned over to the National Academy of Sciences in Washington for evaluation. Sixteen were recommended to NASA, and six were selected in June 1965. Although the call for volunteers did not specify flight experience, two of the applicants were qualified jet pilots and did not need the year of basic flight training given the others. Another 19 pilot astronauts were brought into the program in April 1966, and 11 scientist-astronauts were added in mid-1967. When the Air Force Manned Orbiting Laboratory program was cancelled in mid 1969, seven astronaut trainees transferred to NASA. Initiated in 1958, completed in 1963, Project Mercury was the United States' first man-in-space program. The second U.S. manned space program was announced in January 1962. Gemini involved 12 flights, including two unmanned flight tests of the equipment. The Apollo program included a large number of uncrewed test missions and 11 crewed missions. 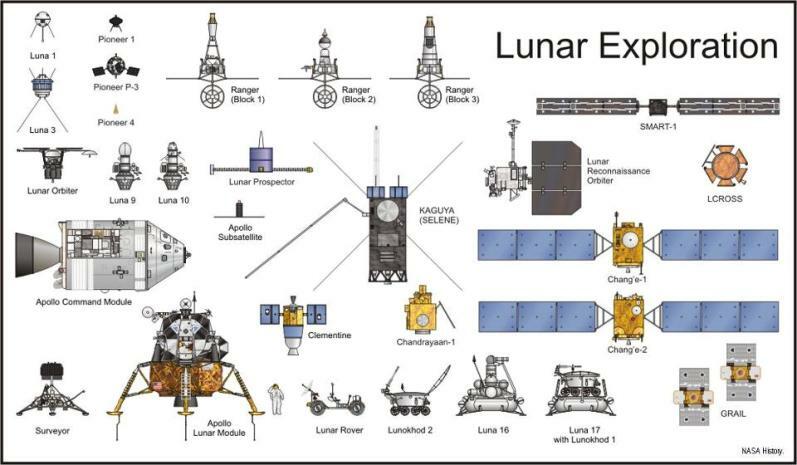 The 11 crewed missions include two Earth orbiting missions, two lunar orbiting missions, a lunar swingby and six Moon landing missions. 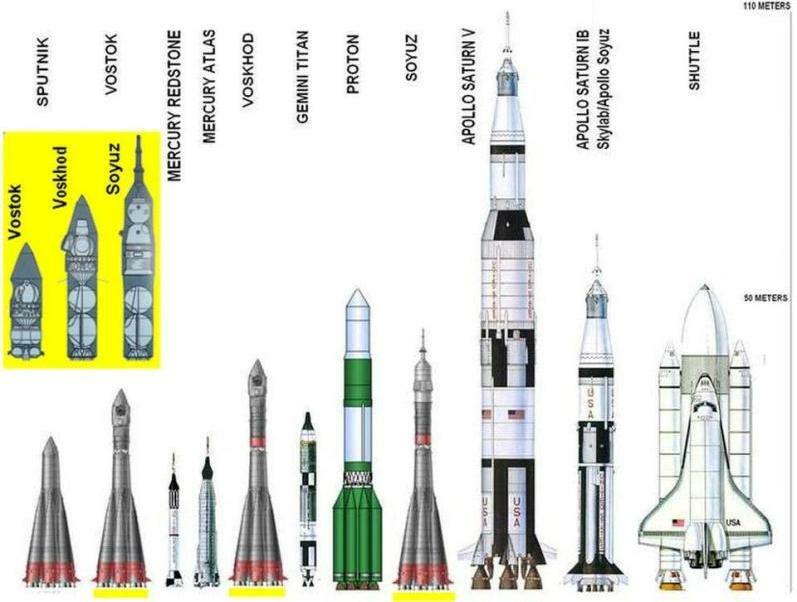 The mission started with the Russian Soyuz launch on July 15, 1975, followed by the U.S. Apollo launch on the same day. Docking in space of the two craft occurred on July 17, and joint operations were conducted for two full days. Both spacecraft landed safely and on schedule. The Space Shuttle is a viable part of American History. Standing as one of NASA's foremost projects, the shuttle has accomplished many tasks that have enhanced the quality of life on Earth. View archives of every shuttle mission here. Designed for long duration missions, Skylab program objectives were twofold: To prove that humans could live and work in space for extended periods, and to expand our knowledge of solar astronomy well beyond Earth-based observations. Phase 1 was a NASA program encompassing 11 space shuttle flights over a four-year period. It used existing assets - primarily U.S. shuttle orbiters and the Russian Space Station Mir - to build joint space experience and start joint scientific research. The most complex engineering and construction project in the world is taking place in space. 16 countries and over 100,000 people are contributing to this monumental achievement.